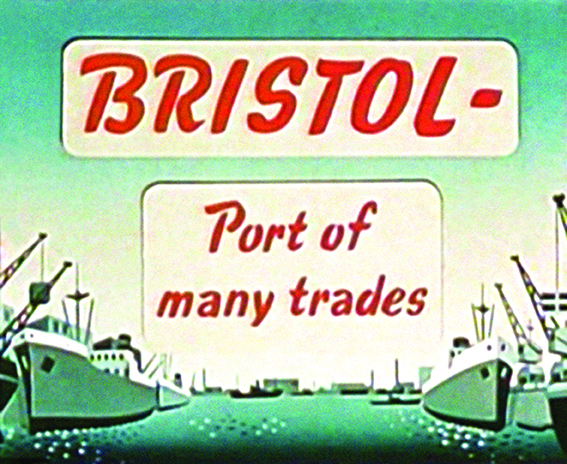 Opening Image to The Port of Bristol, 1950s. Production BY FG Warne. Sponsor: Bristol Port Authority, Bristol City. In the 1920s and '30s, and for over two decades following the Second World War, British municipalities not only exercised control over commercial screenings and cinemas, but also projected and lent non-commercial films. Many also either made or commissioned films featuring their own citizens, places, and services. Nearly two hundred municipal films and film fragments have been identified, varying in length and sophistication from A City Speaks, produced and directed by Paul Rotha for the City of Manchester Corporation in 1947, to amateur footage of municipal flowerbeds. This work examines municipal cinema as a filmic representation of the concerted making of modern democratic life, as it embodies new collective and domestic practices, spaces and architecture. It examines its distinct contribution to early documentary and educational cinema, the influence of nineteenth-century urban and architectural photography and traditional forms of popular culture. No other work presently exists on municipal cinema in Britain. Elizabeth Michelle Lebas is a reader in visual culture, a senior research appointment that includes teaching interior architecture students. Besides degrees in political studies, she has a post-graduate diploma in history and conservation of landscapes, parks and gardens from the Architectural Association, where for twenty years she taught in the Housing and Urbanism and later in the History and Conservation of Parks and Gardens graduate programs. Her interests are in urbanism: presenting contemporary theory, examining the role of women in the British public landscape, and researching the filmic representation of modern urban reform. In 2004, she was Garden Fellow at Dumbarton Oaks; in 2005, she received a visiting fellowship from the Society of Architectural Historians to present her work on municipal cinema at its annual conference; and in 2008, she received a research support grant from the Paul Mellon Centre for British Studies to complete archival research on this topic.